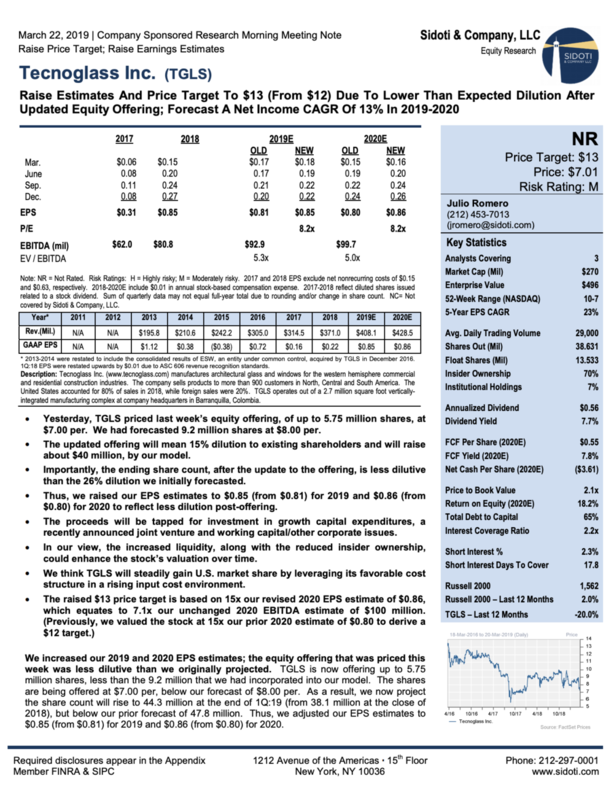 Equity research on Tecnoglass (TGLS) produced by Sidoti as part of its Company Sponsored Research program. Tecnoglass Inc., through its subsidiaries, manufactures and sells architectural glass and windows for residential and commercial construction industries in North, Central, and South America. The company offers soft coat, laminated/thermo-laminated, thermo-acoustic, tempered, silk-screened, curved, and digital print glass. It also produces, exports, imports, and markets aluminum products, including profiles, rods, bars, plates, tubes, and other hardware used in the manufacture of architectural glass settings, such as windows, doors, spatial separators, and similar products. In addition, the company provides floating facades, windows and doors, commercial display windows, hurricane-proof windows, automatic doors, bathroom dividers, polyvinyl structures, and other components of architectural systems. It markets and sells its products under the Tecnoglass, ES Windows, and Alutions brands through internal and independent sales representatives, as wells as directly to distributors. The company was founded in 1984 and is headquartered in Barranquilla, Colombia. Tecnoglass Inc. is a subsidiary of Energy Holding Corporation.